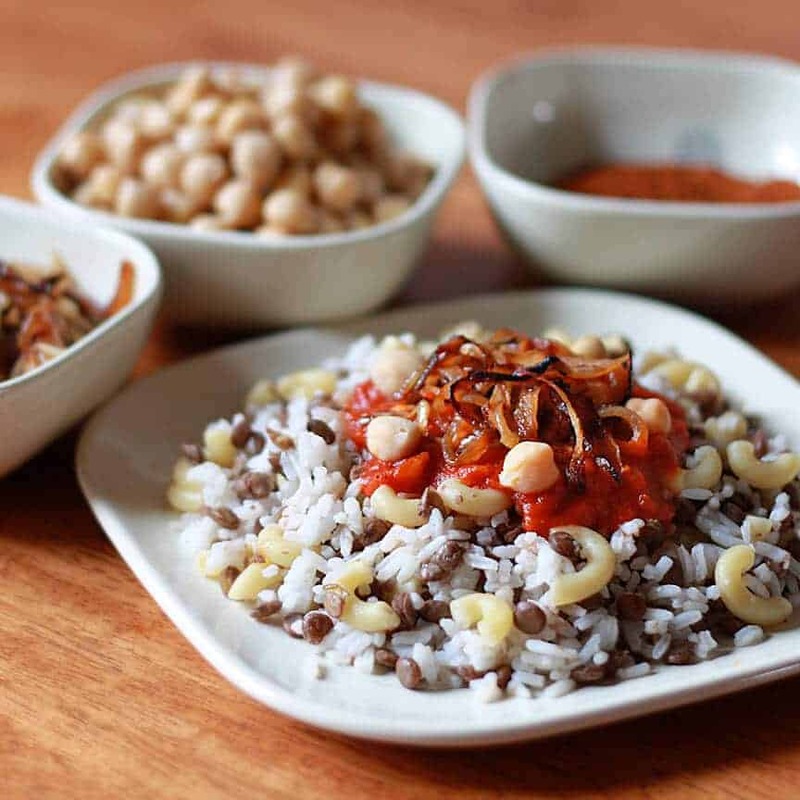 Koshari (also spelled Koshary or Kushari) is the national dish of Egypt. It’s served in virtually every Egyptian restaurant, in every Egyptian home, and on every Egyptian street corner. Street vendors serve the dish from carts to people eagerly waiting in line to eat this beloved and highly popular dish. 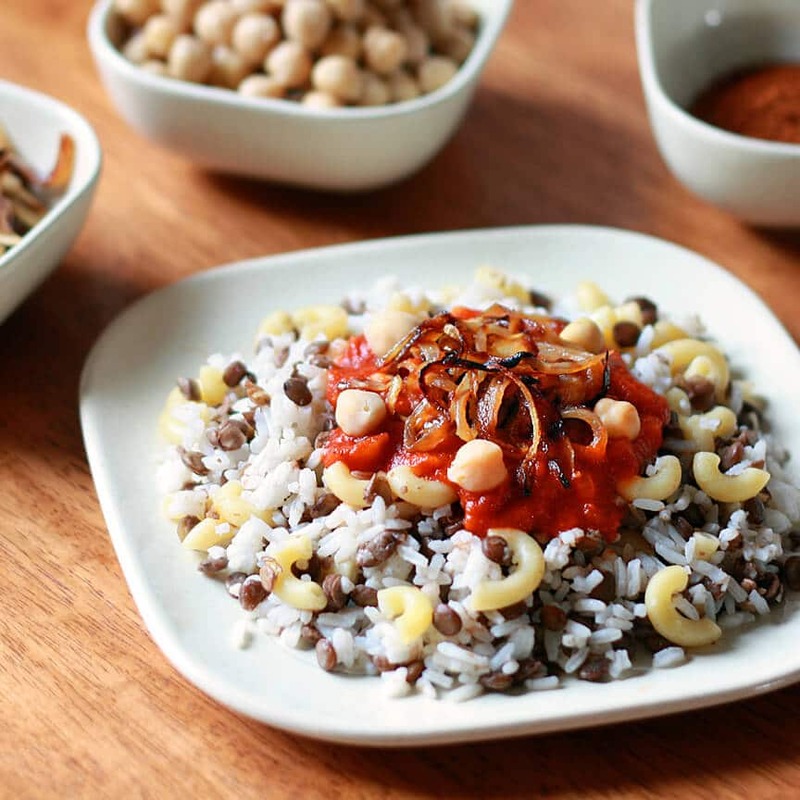 An unusual combination, Koshari mixes lentils, macaroni noodles and rice into a single dish and it’s then topped with a spicy tomato sauce that uses a special Middle Eastern spice blend, garbanzo beans, and fried onions. The idea sounds strange…until you taste it. Then you’ll know why this dish is a favorite among Egyptians. Egyptians and tourists fondly speak of the “Koshari Man,” the title bestowed upon street vendors who sell the dish from their carts. Aziz Awad, who used to be a Koshari street vendor and now works at a downtown restaurant, describes it this way: “The Koshari man grabs a bowl, and scoops a little of each ingredient into the bowl….Each Koshary dish takes about five seconds to [assemble]. His speed can be surprising to you. I have worked here since we opened 10 years ago, and before that I sold Koshary on a street cart, so I have to be fast. My hands are accustomed to the same movements I do all day everyday, so you can say that I memorized the movements rather than think about them” (www.touregypt.net). Every Egyptian knows and recognizes the sound of Koshari being made from down the street. Heba Fatteen Bizzari explains, “As the Koshari man scoops, he knocks his metal spoon against the sides of the bowls, making the Koshari symphony that you won’t hear elsewhere. When the Koshari man prepares an order of more than four the restaurant fills with sound as if it was a rehearsal for a concert. The restaurants of Koshari are very noisy. One sits to eat while the Koshari man practices his drums in your ears” (www.touregypt.net). Though it is Egypt’s national dish, it isn’t actually Egyptian in origin. 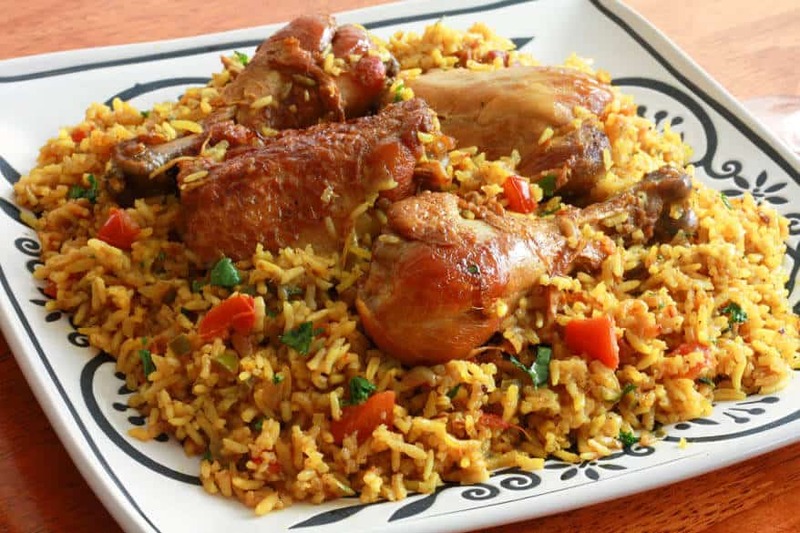 Neither rice nor macaroni are indigenous to Egypt. It is believed that Koshari originated in India and dates back to the time of British Colonization. The name “Koshari” is actually from the Hindu “khichri”, which refers to a dish of lentils and rice. When the British arrived in Egypt in the late 1800’s they brought this dish with them – it was inexpensive and filling. It didn’t take long before the dish was enthusiastically embraced by the Egyptian people. The crowning aspect of this dish is the flavor-packed, spicy tomato sauce. It’s made with a special spice blend called Baharat (Arabic for “spice”), an all-purpose spice blend commonly used in Middle Eastern cuisine. Just a pinch adds depth and flavor to sauces, soups, stews and meat. I stocked up on on a myriad of Middle Eastern spices when I was in Jerusalem and have been making my own blends since. Unless you have a Middle Eastern store in your area or order it online, this spice blend can be challenging to find. However, as with any spice blend, it’s much better made fresh in your own kitchen anyway and I’m going to share my recipe for it with you! Now let’s move on to the Koshari. This recipe is very authentic and very simple to make, but be prepared to dirty up a few pots! The national dish of Egypt. Heat 2 tablespoons of olive oil in a medium saucepan over medium-high heat. Add the rice and fry it for 2 minutes, then add the vegetable stock. Bring it to a boil, decrease the heat to low, cover and simmer for 15 minutes or until the rice is cooked. Rinse the lentils under cold water and add them to another medium saucepan with 2 cups of water. Add the garlic, cumin and bay leaf and bring it to a boil. Reduce the heat to low, cover and simmer for 20-30 minutes or until the lentils are tender. Once cooked, add the salt and stir to combine. Strain any excess liquid if necessary. Note: Prepare the rice, macaroni and lentils while the sauce is simmering and leave them covered in the pots to keep warm. Heat the oil in a medium saucepan over medium-high heat and add the onion. Cook until soft and translucent, about 5-7 minutes. Add the garlic and saute until golden brown. Add the tomato sauce, baharat, salt and pepper to taste, chile flakes (if using) and red wine vinegar. Bring it to a simmer, reduce the heat to low, cover and simmer for 20 minutes, stirring occasionally. To make the crispy onions, heat the oil in a skillet. Add the onions and fry until dark brown. Using a slotted spoon, remove them from the oil and place them on paper towels to drain and cool. I feel like I just learned so much from this post! I love ethnic foods with warm spices and different ingredients, so this dish has me intrigued! I’m pinning it to my to try board!! Thanks, Julia! It’s really so much fun, isn’t it? To try new foods with new flavors and to simultaneously learn about the accompanying culture….It makes for great conversation around the dinner table while enjoying the dish you’re talking about. You are so welcome and thank you for visiting! Thank you for this recipe. I used to live in Egypt and every recipe I made prior to this did not use Bahrat. That made it taste just like I remember. Thanks so much! You are very welcome, Joe! I’m so glad that you found my site and tried this recipe. There are some other great North African and Middle Eastern recipes on here – and many more to come. I hope you’ll visit again! I just made a batch of the spice mixture so that I can try both the kosheri and chicken recipes later in the week. Now my kitchen smells great! Hi Christine! Wonderful! I love the smell of freshly prepared spice blends! I’d love to hear what you think of the other recipes once you’ve made them! We made this tonight, and I had to stop myself from going back for thirds! Thank you so much. SO happy to hear it, Jay and Kelly! Since you enjoyed both the Chicken Machboos and Koshari so much, I’ll need to make a note to post some more Middle Eastern dishes in the near future. Thank you so much for making this and for your feedback! Gosh, my pantry was bare, and I googled “tomato sauce and rice,” which is what I was down to, and this recipe popped up! I didn’t have the chickpeas, and used brown rice spaghetti that I broke into pieces, since I had no macaroni. I also made the baharat with the spices I had on hand. This was sooooo delicious! Very satisfying and comforting, not to mention cheap! This will become a dish in our rotation for sure. Thanks so much for posting it! Crystal, that’s wonderful! You know what they say about necessity being the mother of invention and that goes for food, too! Some of the best recipes I’ve developed have come as a result of my determination to use a specific set of ingredients rather than let them go to waste. And yes, cheapness is one of the reasons this is Egypt’s national dish – it’s simple, easy, delicious and inexpensive. I’m so happy you found and enjoyed this recipe and appreciate your feedback! Not sure if I’m not reading the recipe right but when do you add the quartered clove of garlic and 2 onions finely sliced? Is it with the lentils? Hi Sally! The garlic is added in step 2 with the lentils and the onions are added in step 6. The instructions for the crispy fried onions that go on top are in step 7. As an Egyptian I would love to say that you’ve done a wonderful job. The dish looks absolutely gorgeous! Can I please use this picture in Egypt’s Wikipedia page in the “Cuisine” section? It will be a fantastic addition to the page. Thank you very much for the compliment, Yasser! I really appreciate that. As to the Wikipedia matter, as much as I’d like to say yes, I unfortunately have to say no. The reason being, any pictures submitted to Wikipedia become public domain and can be used by anyone at any time for anything (including commercial use) – without restriction. Still, I greatly appreciate your compliment and I thank you for visiting. Thank you, Chef Mireille! So glad you’re making this and thank you for stopping by! It’s true the portions are very generous in that region of the world. Very different than, for example, France where you leave the restaurant still starving! :) Thanks for visiting, Natalie, and enjoy the Koshari! Excellent, happy cooking and enjoy! There are 3 instances of onion called for in your ingredients (once in the main bunch, once with the sauce, and once with the crispy onions), but they are only in the instructions for the sauce and crispy onions bits. The “2 large onions, thinly sliced” are unaccounted for. Hi Emily, thanks for pointing that out! The “2 large onions, thinly sliced” are for the crispy onions portion only. Koshari is great – and very healthy! High fiber, high protein, vegan, and if you measure your ingredients carefully (and omit the crispy onions), about 425 calories will fill you up. Thanks for getting this recipe out there! Dumb question… is that two cups of cooked macaroni or uncooked? I assume uncooked but that seems like a lot relative to the amount of rice. Hi Don! Yes, it’s 2 cups of uncooked macaroni. Happy cooking! This was good! I will make again, next time either reducing the macaroni to a cup or increasing the amount of sauce. Also I caramelized the onions in a bit of butter or olive oil instead of deep frying them (I’m after the flavor more-so than the texture) and they added so much to the dish. Great to see a good koshari recipe. I’ve also used your baharat recipe for a few dishes so far and keep looking for more ways to use it because it is a unique flavour. I’ve been making koshari (without proper baharat – until now) for years and found your blog while doing some research to find info on it for a blog post of my own on koshari: http://tinyurl.com/n2bv9ka . I’ve found myself coming back to your blog often since then. I’m keen to try your Spicy Moroccan Veggie burgers, Chicken Machboos and Balsamic Glazed Steak rolls in the next few weeks. Thanks, Bunny, I’m happy you found my blog! 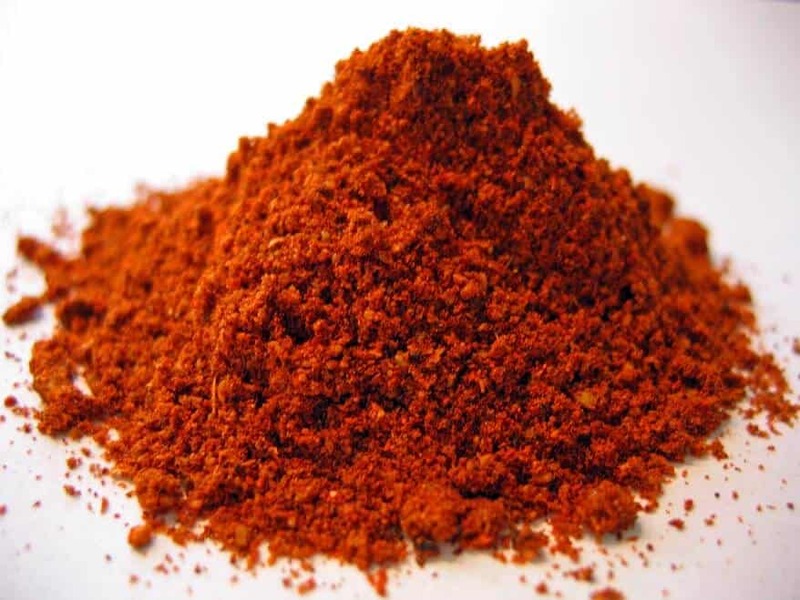 Baharat really is a wonderful spice blend, isn’t it? Let me know what you think of the dishes you mentioned once you’ve had the chance to try them. Thanks again and happy cooking! Awesome, ptsorange! So glad it was a hit! I tutor a little Egyptian boy through our church’s tutoring program. So I have interest in what he eats. I made this today and it was fabulous. I ate 2 small bowls. Filling and the spicing mixture was the best compliment. I am taking a dish to his house today to see what they think. They are always so sweet and generous and their house smells wonderful as grandma cooks dinner. I wasn’t sure of this recipe at first but was intrigued by the concoction of spices…. the aroma and the taste was delicious, we loved it! Wonderful, I’m happy you enjoyed it! Yes, it’s one of those dishes that initially sounds a little boring but the flavor combination is fabulous and the delicious sauce really brings it all together. I made this recipe last night, and my husband and I really liked it. I didn’t have any cardamon, so I used a tiny bit of garam masala seasoning. My husband said it did taste a lot like the koshari we used to eat when we lived in Cairo. :) It made plenty for 4 people, so we’ll be enjoying the leftovers! Next is the spiced chicken and rice dish. Thanks for sharing these recipes! Hi,as an egyptian I really appretiate your work but l have just a little note.we use only salt,pepper and some use cumen but never use baharat.try also dawood pasha kofta served with egyptian rice cooked with vermicelli cuts as another taditional egyptian dish. Hi Mahy! I’ve had several other Egyptian readers confirm the authenticity of this dish. I was even contacted by Egypt’s official board of tourism who complimented its authenticity and wanted to use this on their Wikipedia site. Like most traditional dishes in any country, I’m sure there will always be variations from household to household. The dawood pasha kofta sounds wonderful, thank you for the recommendation! 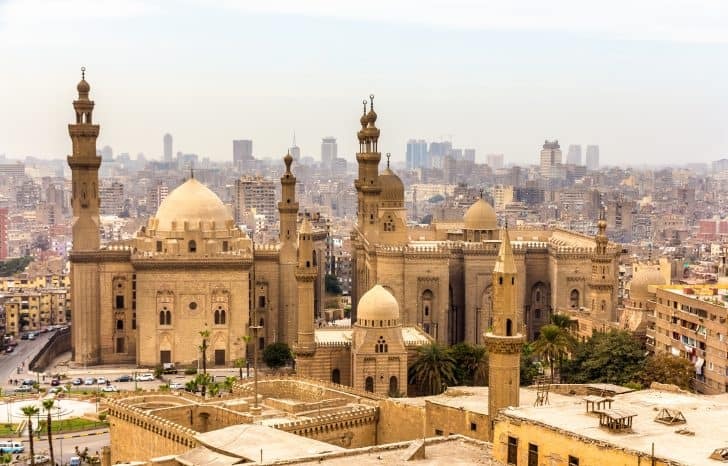 Hi Kimberly -thanks for writing so evocatively about Egypt. I just want to say, looking at your recipe, and the beautiful picture -I just want to add some notes for extra authenticity. First, the vinegar. Egyptians only know and use plain old wine vinegar. Red wine vinegar is fancy/expensive/unheard of. Second, your recipe omits a second and very important sauce called the Dukka. This is ground cumin, garlic and chili in vinegar. This is added separately at the table. Fourth, your onions needs to be much much darker than this. You need them to be the colour of darkest caramel, of chestnuts. Not of honey. 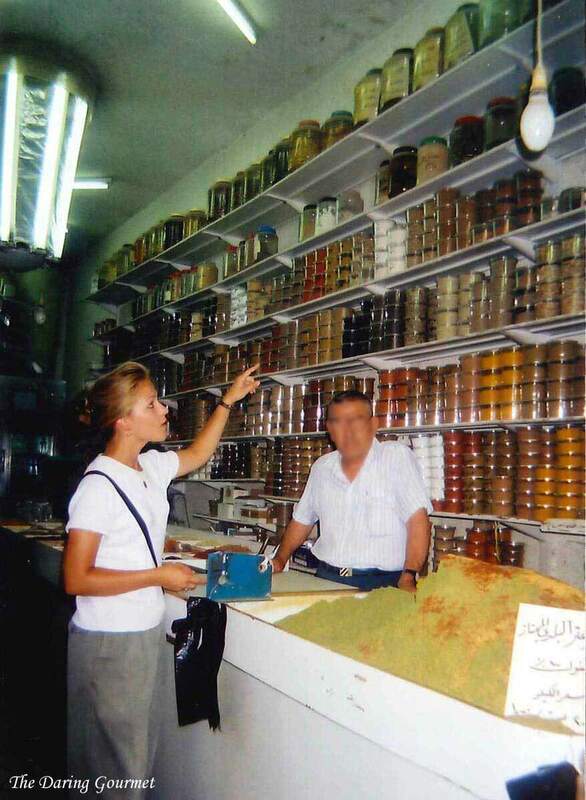 I also agree with Mahy – BAharat is a Libyan spice mix, also similar to Lebanese 7-spice mix. We don’t use it and you can’t get it here. Hi Yasmine, as I replied to another comment, I’ve gotten contradicting feedback from several Egyptians via comments and personal emails. But whatever the case may be, the baharat with its complex flavors adds a remarkably delicious dimension to this dish and in the end, that’s what matters most! Thank you, thank you, thank you! We love this recipe. My third generation Egyptian sister in law makes a variation where she cooks the lentils with broth, onions, cumin and garlic and leaves them quite soupy. Then, instead of making the spicy tomato sauce, she tops the dish with lots of chopped fresh tomatoes and tons of her wonderful fried onions. The piece de resistance – she drizzles the browned olive that she used to fry the onions over the top. I’m thinking from now on we’ll be eating your recipe in the winter and hers in the summer when the tomatoes are overgrowing our garden. I love the spice mixture – can’t wait to try the chicken dish. Thanks, Deborah! Most people are really surprised at how amazing this dish is the first they try it. 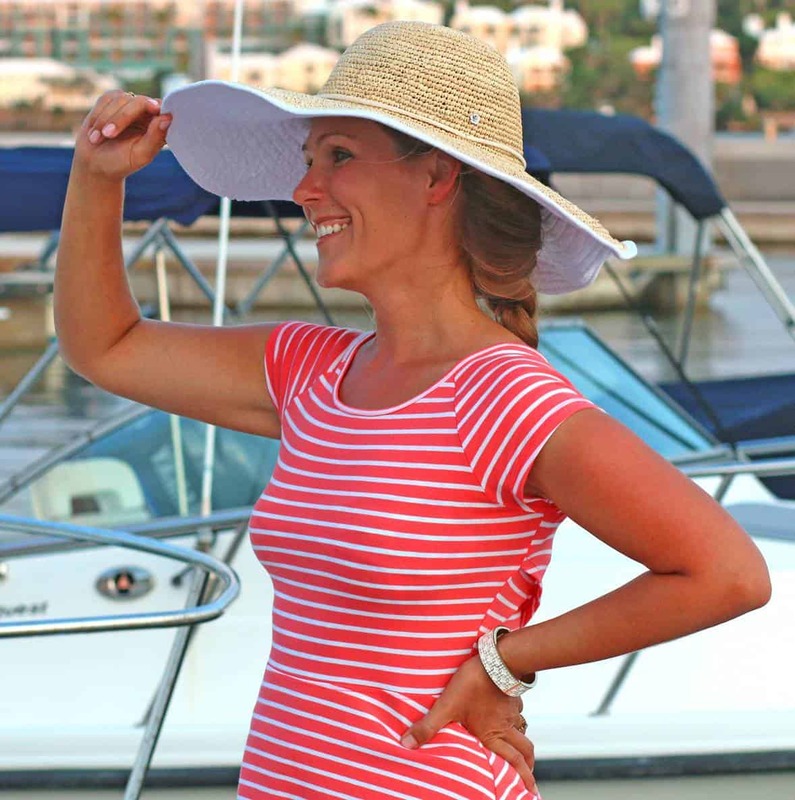 I’m so happy you enjoyed it and YES, the Winter/Summer plan sounds perfect, thanks for sharing! I had saved this recipe a longtime ago. Yesterday I got the chance to try and it turned out amazing. Thank you! I will forward your link to my friends group. That’s wonderful, Saadia, thank you so much! Thank you so much! I’ve just rediscovered koshari and was so happy to be able to make this with my (currently) barely-stocked pantry ingredients. Absolutely love the accompanying baharat recipe; I had to go with your koshari after seeing what the baharat entailed. Will definitely be doing some research to find what else I can use it in. Wonderful, Sonja, I’m so glad you enjoyed it, thank you! Thank you for the wonderful recipe and for sharing the experience behind it. Suqs in Muharraq, Madinat at Isa and Bab al abahrain are ideal places to go looking for the perfect spices. Preparing Baharat from scratch sure improves the flavours so much than stores bought pack. Thanks for the tips, Johnson, and I agree – nothing compares to making spice blends from freshly toasted and ground whole spices. Thank you so much for the recipe. I am dating someone from Egypt so I thought it was time to learn new recipes. I made it for my family first and they loved it. The real test will come when he tries it. By the way, I followed your recipe for the blended spice Baharat….awesome…loved it! Awesome, Pauline, and I’m so glad you made the Baharat! Thanks so much and yes, please let us know what your boyfriend thinks when he tries it. I recently discovered this recipe and it is so fabulous I’d like to have it every day! The sauce alone is so good I’m going to make a batch of it to use on pasta. Thank you! Wonderful, Jules, thanks so much! Thank you so much for this recipe and the Baharat recipe. I tried this dish at a restaurant this weekend and immediately fell in love. Unfortunately, the restaurant is two hours from where I live so it’d be hard to fulfill any cravings. I made your recipe last night with a few tweaks and it was so good. The sauce is almost identical to the restaurant. I made barley instead of rice & pasta since I’m cutting back on starches for my diet and it was fantastic. I love trying new vegetarian friendly dishes. Definitely adding this one to my repertoire. So glad you enjoyed it, Dani, thank you! I’m so thrilled to hear that, Gary, thanks so much for the feedback! I wanted to try making this but I can only get tomato puree “double concentrate” in small cans, how much of this should be used and how much should it be diluted? Hi Mark, yes that’s no problem. Dilute it with water using a 1:1 ratio (1 cup water per 1 cup tomato puree). Happy cooking!